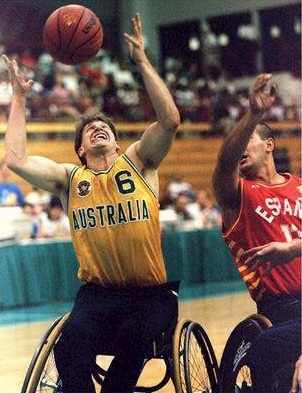 A spirited international wheelchair basketball community provides lots of support for hundreds of men and women mobilized for action. 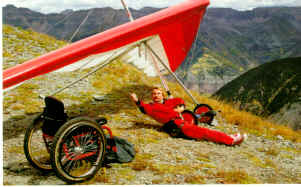 Hang-gliding is catching on as wheelers get out of the chair and into the air . 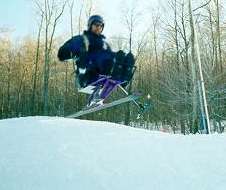 . .
Snowskiing has become a popular winter sport for wheelchair users, who hit the slopes with abandon when the temperatures fall. 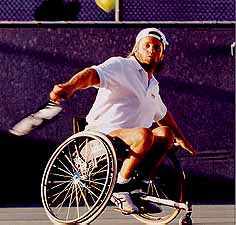 'Brutally competitive' hardly seems adequate to describe wheelchair hockey. As in quad rugby, the repair shops see lots of action after the game. 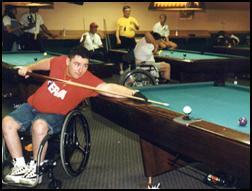 There's even an electric 'power' wheelchair hockey movement. 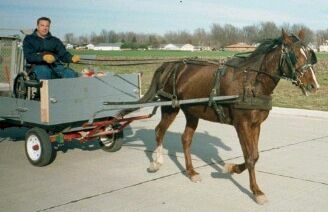 Mark Simons lives on a horse ranch in Illinois, where he likes to horseback ride and, as shown above, to use his horsedrawn 'chair-iot'. like this rugged model are a downhill success with hardy types. and quick pivoting three-wheeled sportschairs are the rage. 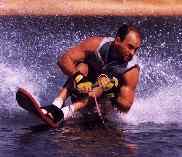 who can ski just fine sitting down. 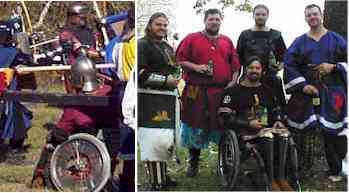 If you'd like something a little less intense, join those who enjoy wheelchair billiards, or the equally popular wheelchair bowling. 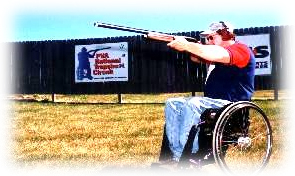 Trapshooting is one of many wheelchair sports sponsored by organizations like United Spinal Association, formerly the Eastern Paralyzed Veterans of America. 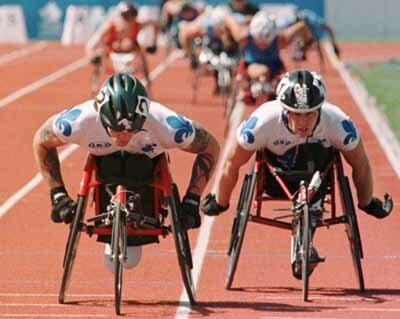 Wheelchair racing has become a major sport, and every marathon finds wheelers among the ranks, pushing the limits of their skills -- and the public perception of what the disabled can do. Weight training and gym workouts are important among chair users, to tone the upper body and stay trim. The 'No Boundaries' exercise equipment above is typical of products now available to help wheelers keep in shape. 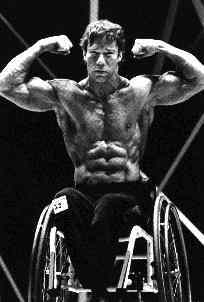 Of course, you can muscle your way to the top, like mathematican Ken Archer, above, who won several wheelchair bodybuilding competitions, after retiring from a wheelchair racing career. 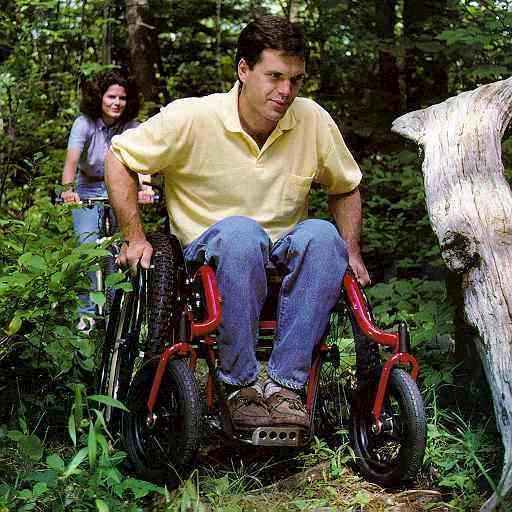 Just when you think you've seen it all, you discover Geno Rodgers, paralyzed from the shoulders down, who'll do just about anything to stay active. 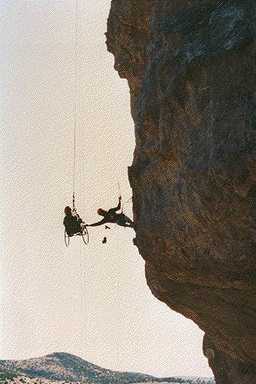 Here, he climbs a cliff in New Mexico -- in his chair! 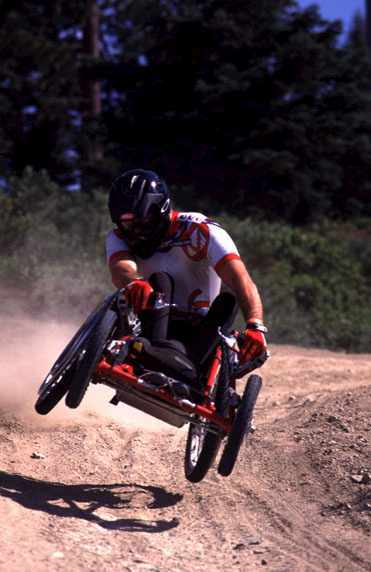 To explore the range and depth of wheelchair sports, check out the list of contact addresses and internet links from Sports 'n Spokes magazine. 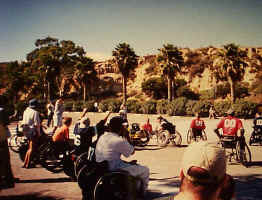 Disabled Sports USA, founded in 1967 by disabled Vietnam veterans, has local chapters in more than 80 cities and towns nationwide.
. . . Just get out there!